This recap is a bit belated, but I returned home to New York two weeks ago, having had a terrific time attending the Genealogical Research Institute of Pittsburgh (GRIP) for the first (but hopefully not last!) time. After completing Boston University’s Certificate Program in Genealogical Research last fall, I wanted to continue my genealogical education with more in-depth (and in-person) study at one of the excellent institutes that exist for that purpose. Among the major institutes are the Salt Lake Institute of Genealogy (SLIG), the Genealogical Institute on Federal Records (Gen-Fed), the Institue of Genealogy and Historical Research (IGHR), and others. Now in its fifth year, GRIP makes use of the campus of La Roche College, in suburban Pittsburgh. Over 130 genealogists (from 35 states, and multiple countries) convened on the La Roche campus to enjoy in-depth instruction from leading genealogical minds in one of six different course options. I decided to attend GRIP largely because of its excellent reputation and incredible course offerings, but also due to the timing. As a business owner, it’s hard for me to get away from New York City for more than a couple days at a time – so it was a real treat to get to spend a whole week studying advanced genealogical topics. 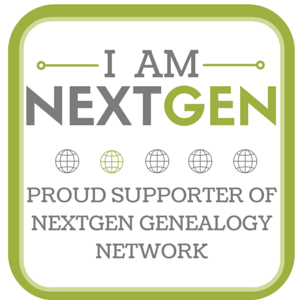 I chose to take “Mastering the Art of Genealogical Documentation”, taught by legendary genealogist/educator/writer/editor Thomas W. Jones, Ph.D. I had previously heard Tom speak at the New York State Family History Conference and am in possession of a very well-thumbed edition of his definitive work, Mastering Genealogical Proof, so the opportunity to study with him for a week was one I could not turn down. On the first day of class we all introduced ourselves and, when asked why we had selected this particular course, “citation anxiety” was the number one answer given (present company included) . The general skill level among my classmates was quite advanced (including multiple Certified Genealogists), but I noted a commonality among all of us: we all had a strong desire to do things the “right” way, and to be able to write professional and thorough citations without being overly dependent upon templates and examples. As a young(er) genealogist (I was dubbed the lone/resident “Gen X’er” by a classmate), I have many questions about citation and the function of thoroughly-cited sources in research, particularly with the emergence of digital sources. I came in with a goal of augmenting my knowledge of traditional citation standards and methodologies, and I feel I was able to get a much better sense of not only how to write thorough citations, but how to do so “from scratch”. Though I wish I could rewind and re-live many of the discussions we had during our 5-day course, I left GRIP with much greater confidence in my own citation ability, and found the entire experience to be wholly worthwhile. GRIP also offers supplementary programming in the form of free lectures (open to the public) for a number of evenings during the Institute. I attended two of three lectures: Marian L. Fisher’s “Thinking Over Time: Researching USCIS Records” was a big highlight for me as I’m currently doing in-depth research with a number of USCIS record sets, and learned a great deal from Ms. Fisher’s excellent presentation. 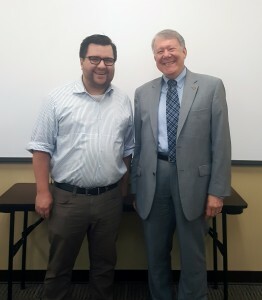 I was also able to attend F. Warren Bittner, CG‘s talk, “Understanding Illegitimacy: The Bittner Bastards of Bavaria”, which was very enlightening regarding social conditions surrounding illegitimacy rates (and how illegitimacy was defined) in European cultures. 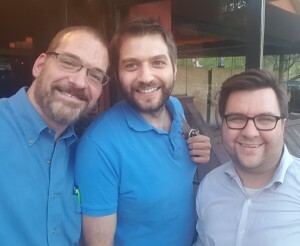 Another highlight of GRIP was the opportunity to reconnect with genealogical colleagues and friends, and to make some new ones. I opted for the dorm-room/meal-plan option and, though the dorms are pretty barebones, the convenience of staying on campus and not needing a car was valuable. The classwork kept me quite busy, but I had a nice chance to catch up with my friend Tammy Hepps (who was not attending, but is living in the area doing amazing research on her Homestead, PA ancestors – check out her exemplary site, Homestead Hebrews), and also Rich Venezia, who recently moved to the area and has previously attended GRIP. Michael Lacopo, whose must-read blog about his own family discoveries will keep you on the edge of your seat, taught one of the other GRIP courses on Pennsylvania research, and it was great to catch up with him, as well. Catching up with friends, Michael Lacopo and Rich Venezia. Tomorrow, the July session of GRIP will begin – and how I wish I could join them. Leading Italian genealogist Melanie D. Holtz is offering an amazing course on Italian research, but, alas, the dates don’t work out for me this time around. All in all, I gained a great deal from my GRIP experience and am hopeful that I’ll be able to return for a future session. GRIP 2017 will not begin to accept registrations until after the new year, but the courses have been announced, and it’s safe to say there’s something for everyone – perhaps you’ll attend!